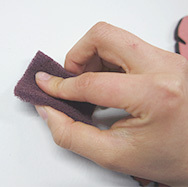 You have to rub the wall using a sandpaper that is packed with your product to remove coating film of the silk wallpaper. 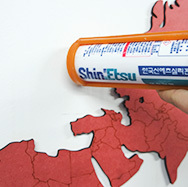 If you want to stick your product more firmly, you should use silicon. Power Supply: Box, Wall clock and fittings. Moro wants to realize various designs and colors, So we use the best materials that have the same inner and external colors to body out many kinds of visual effects. Moreover we use eco-friendly materials that are harmless to human bodies and that are not discolored easily. Also, they are based on a Self-control Safety Management Standard, so they are conformed to safety Standards of raw materials for infants toys. Furthermore they have various funtional and multiple effects, therefore they are materials that can be applied to multiple purposes. 1. Remove a sticker on the back. 2. 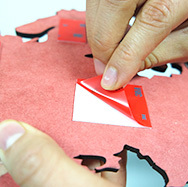 Then, look at the leaflet in the box, put the pieces together. 3. 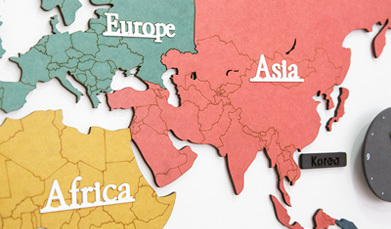 If the continents are put together perfectly, You can complete the world map. As a lover of studying the different countinents and countries of the world, I decided to order this product a couple days ago. Not only did I like the different colors marking each continent, but I also liked the design of having three clocks instead of one, so I can look at the time easily no matter what section of my room I am in. 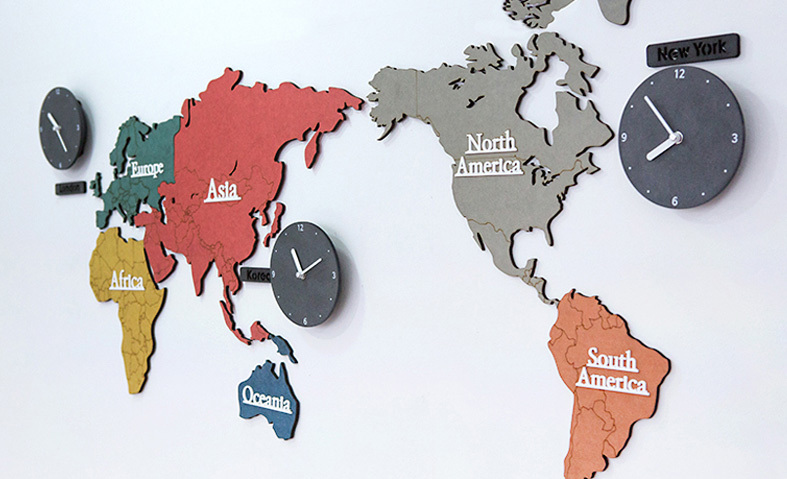 Overall, this is a very interesting take on a general map imtermixed with clocks, and I did enjoy the result! this clock is extremely unique, and I've gotten many compliments on it from people who have visited my home. I hung this up in my living room and I feel like it ties everything together perfectly. This is obviously pricier than the others, but it is definitely worth it when you think about the awesome quality and quantity of the product you are getting! Basically, I would highly recommend getting this clock!